Doctor Who followed up last week’s Black Water with an entirely satisfying conclusion in Death in Heaven. Steven Moffat has no qualms about putting in the big scenes with big ideas even if not entirely logical, but he did it well enough that only the most fanatic Moffat haters should object to this episode. Moffat certainly gave us quite a lot in this episode including The Master/Mistress, Cybermen, UNIT, reopening the question of the location of Gallifrey, and a conclusion to the Danny Pink storyline. 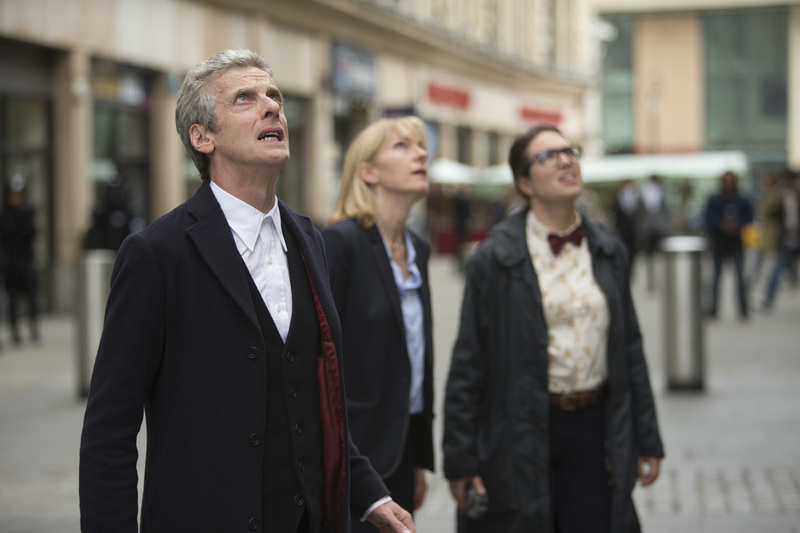 Osgood returned, this time wearing a bow tie like Eleven (“Bow ties are cool”) in place of her Tom Baker scarf. 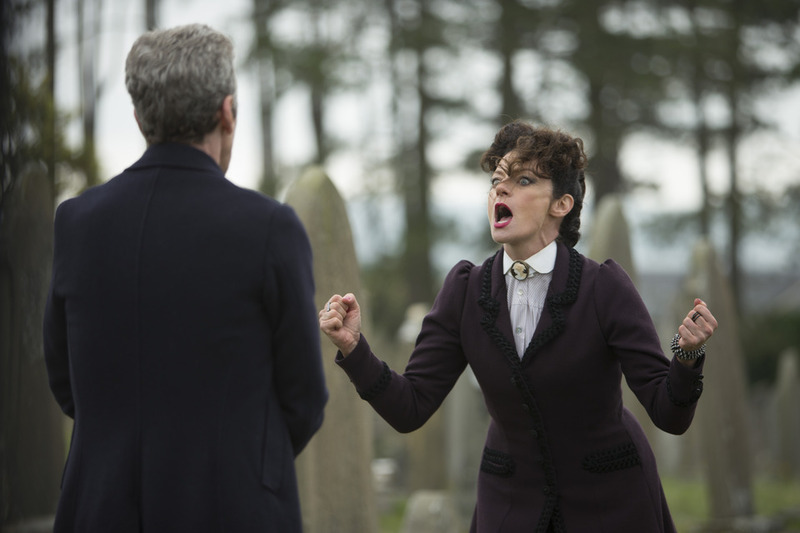 Many episodes of Moffat’s stories have major scenes in a cemetery, and this happened once again. As was expected after we found that Missy was the Master, or now regenerated as a woman and calling herself the Mistress, and that the Nethersphere was using Timelord technology to upload the minds of the dead, the claims about the dead on Black Water were all a ruse. It became necessary for the BBC to make this point clear before Death in Heaven was aired due receiving a lot of complaints about the claims about death in the previous episode. 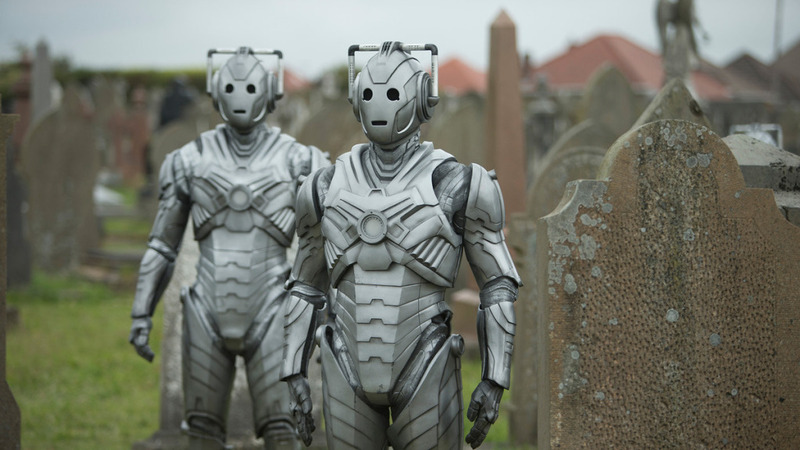 Instead of cremation really leading to pain felt after death, cremation just diminishes the size of the Cybermen army. What of those whose bodies had decayed over time? While they cleared up some issues from last week, are there now going to be complaints because of children believing grandma and grandpa were turned into Cybermen? There was still more misdirection. Moffat lies, and he did it again in this episode, both with the teaser from last week and the words from the characters. He added to the mystery of Jenna Coleman saying there never has been a Clara Oswald in the previews by having her next claim to be the Doctor. They made this almost appear credible by giving her top billing, and using her eyes, in the opening credits. This second time in which she claimed to be the Doctor (previously in Flatline) turned out to be a lie to fool the Cybermen, but it did create some momentary questions for viewers. This was not the only key lie of this episode. People at UNIT did make some questionable decision. 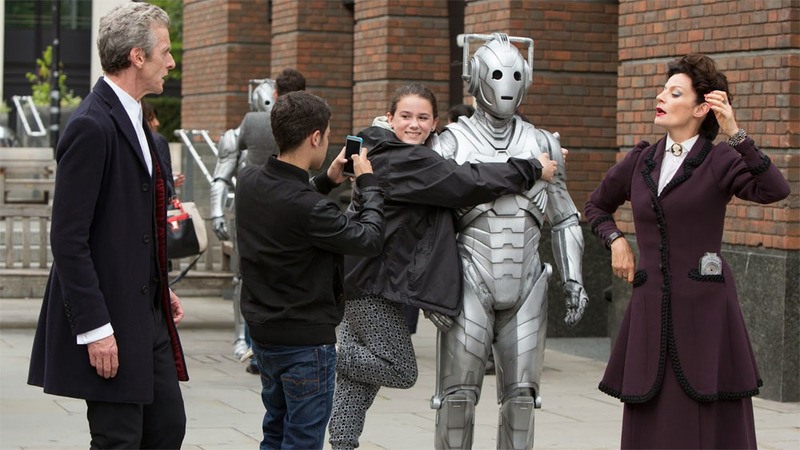 They did start out well, acting like tourists desiring selfies with the Cybermen in order to get close. Then they initiated their protocol in case of an alien invasion of earth and by drugging the Doctor before seeking his help, which is as nutty as Clara’s idea last week of threatening the Doctor to get him to help her after Danny’s death. It made no sense to drug the Doctor, and then put him in charge, as opposed to seeking his advice, when he lacked any detailed knowledge of the forces suddenly placed under his command. It is worth ignoring this, and the other plot holes, to enjoy learning that the internationally agreed upon protocol in case of alien invasion is put all earth forces under a single President, and that the Doctor would be the chief executive officer of the human race. With all the animosity expressed by the Doctor this season towards the military, he is now in charge of the military, as well as taking on the aristocratic role which Danny Pink attributed to him in The Caretaker. Once on their flying headquarters, there were more questionable moves by UNIT along with insanity on the part of Missy. 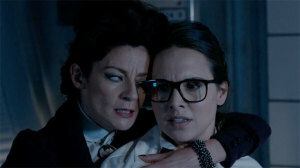 Missy’s killing of Osgood, followed by stepping on her glasses, helped establish how insane and evil she is. When Missy made her move, I would think that Osgood might have been smarter not to have fallen for the old trope of getting close to the villain to hear her plan, the guards might have done something, and Osgood might have gotten out of the room as soon as she heard the threat. Besides, this all could have been avoided if they used more than handcuffs to restrain Missy, or even kept her tranquilized. Once the plane was under attack by the Cybermen, everyone else on board might have run to the TARDIS for safety. Michelle Gomez created a fantastic variation on The Master, along with channeling both Mary Poppins and Marilyn Monroe (Happy Birthday, Mr. President). The Master has often had an insane streak, but probably never to the degree seen in this regeneration. Missy’s actions did seem contradictory with regards to her motives. At one point she seemed to be trying to kill the Doctor, or perhaps she had no doubts in watching him from back in the Nethersphere that he would find some way to escape death. That move of making it into the TARDIS while in free fall must be something he picked up from River Song. We later found that Missy’s ultimate plan was far different from when the Master really wanted to rule the earth in The Sound of Drums. This time the plan was more personal, and more insane. It was also verified that Missy was the one who gave Clara the Doctor’s phone number in The Bells of Saint John, again showing her obsession with the Doctor. Just as she found it amusing to see the Doctor with almost unlimited power, she also found it amusing to join “the control freak and the man who should never be controlled.” This was also an important part of her plan to get the Doctor to the Nethersphere: “You’d go to hell, if she asked, and she would.” If she knew this, does it mean that she had intentionally set up Danny’s death? It is convention on Doctor Who for a character, including the Master, to have some changes in personality with each regeneration. While not going through technical regenerations, Cybermen on Doctor Who have been different at different times in the history of the series. This time instead of using Cybermen to blur the difference between humans and machine, we had a zombie version, in which the dead were used. 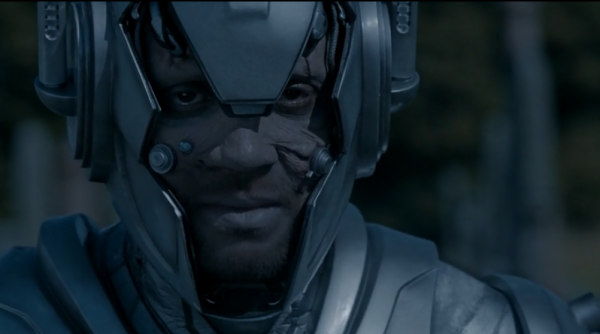 This technique of creating Cybermen was not completely effective as love allowed Danny Pink to resist Cybermen programing. This did provide an easy solution to the problem, but at least did turn seem more credible when it turned out that Danny was not the only one to resist this programming. The Doctor : People keep saluting and I’m never gonna salute back. Matt Smith, playing Eleven, had once saluted Kate in The Power Of Three, and in this episode Twelve did the same for Brigadier Lethbridge-Stewart, now another Cyberman who resisted their programming. Of course if Danny could resist Cybermen programming out of his love for Clara, there should be no doubt that the Brigadier could fight off any alien programming, and would be there to save his daughter. While some are complaining that this version of the Cybermen breaks from continuity, the episode did show tremendous respect for continuity with its multiple references to previous episodes. The episode also concluded the story of the kid shot in Afghanistan, with Danny saving him instead of himself. It was somewhat contrived to stipulate he could only save one of them, reminiscent of inventing rules to prevent the Doctor from saving Amy in The Angels Take Manhattan. Both Clara and the Doctor lied to each other. Clara claimed she would be happy with Danny, and the Doctor claimed he found Gallifrey when there was nothing at the coordinates he received from Missy. This could be seen as a final episode with Clara as companion. I have seen some claims that Clara will be in the Christmas episode, in which the Doctor assists Santa in an attack at the North Pole. If so, this may or may not be her last appearance in light of the rumors she is leaving after the Christmas episode. Maybe she will join the Doctor more intermittently, as Amy and Rory did after they married. Clara’s story might not be over, but it also might become more complicated for her to travel with the Doctor. What about Danny’s great-grandson Orson, seen in Listen, who will continue the family business of time travel? Maybe the death of Danny has rewritten time, or maybe Clara is now pregnant with Danny’s child. Whether or not Clara returns, it is a safe assumption that the Master, either played again by Michelle Gomez or in a new regeneration, will appear at some time. There is plenty of precedent for the Master surviving anything, including being incinerated by the Cyberman Brigadier. With or without Clara, I also wonder if Gallifrey will be a factor next season after being teased yet again–either a search for Gallifrey or actual encounters with other Timelords. I was wrong with this prediction about the current season, but Moffat often plays a long game, and very well could have a payoff for such teases planned for a future season. The Doctor Who Extra for Death in Heaven is above. What made you turn the Master in to a woman? SM: I’d never written a Master story, and there had been a number of Masters in the show from the amazing Roger Delgado through to John Simm, and I could never think of a way to do it which was interesting. And then I thought, if you could smuggle her in to the show in plain sight and then land that one… and then once and for all absolutely establish in plain sight, so nobody has any doubt about this whatsoever: yes, Time Lords can do that… it just expands the show a little bit. And what about Disney fans? She’s Mary Poppins! SM: Mary Poppins has always been evil! I don’t know why. To be honest, it was a gimmick at the start – there’s nothing wrong with a gimmick – and I was really fiddling with how on Earth I was going to write it. Michelle Gomez was on the list for a different part, and she’d been offered another part but couldn’t do it. But then I thought ‘Oh my God, that’s it!’ Michelle is so genuinely barking… I thought there’s never going to be a dull moment on screen! I’ve known Michelle for a long time, because she was married to Jack Davenport who had done Coupling. So I’d known her, I’ve gotten drunk with her, and she actually is like [she is on screen]. That’s toning it down. So is the Master gone now? I was delighted back when the wonderful Anthony Ainley was the Master back with Peter Davison, and he would definitively get fried, or incinerated, or destroyed at the end of each story… and he’d turn up at the beginning of the next one and basically say ‘I escaped’. I had no problem with that! So… observe how I’ve avoided your question! What are the chances? SM: Oh, but the Master has met the Cybermen before. Would you like me to list them? But why the idea to team them up? I’ve never written a Cyberman one, and when I was a kid, I absolutely loved the Cybermen. They were my favourite. I mean, the Daleks were really my favourite, but I pretended that the Cybermen were my favourite to make myself more interesting. Which absolutely doesn’t work. I’d always wanted to make them creepy and scary. I was aware that there is kind of a problem that the Cybermen are brilliant at standing there, and brilliant at breaking out of tombs, fantastic at breaking out of tombs – they’ve been doing that since 1967 – but when they stand up and actually arrive… they’ve a monotone voice, no facial expressions, and no emotions. That can be tricky. You sort of want to put them with somebody who can be the interface. But I love Cybermen. I don’t even know why they’re great. The absolutely indispensable part of the Cybermen is that they’ve got handles there… I mean the idea of removing them would be heresy… But what are they for? But I do adore them. Especially an old show called The Tomb of the Cybermen, which I’ve ripped off many times, it’s just perfect Doctor Who. Glorious Doctor Who. Posted in In The News. Tags: Amy Pond, Angels Take Manhattan, Black Water, Clara Oswald, Daleks, Danny Pink, Death in Heaven, Doctor Who, Flatline, Into The Dalek, Jenna Coleman, Listen, Matt Smith, Michelle Gomez, Peter Capaldi, Peter Davison, Power of Three, River Song, Science Fiction, Steven Moffat, The Bells of St. John, The Caretaker, Tom Baker. RSS feed for comments on this post.. TrackBack URL.